« The Byron Chronicles Season 2 Finale, AKA: Can I Start Crying Now? I recently got a friend to listen to Lost Frontier, and in the process of converting a new fan I got another chance to re-listen to the series that rekindled my interest in Star Trek. The two most recent episodes, The Valiant Parts 1 & 2, are probably two of the best of the series. Sure, I love Lost Frontier as much as any rabid Trekkie, but I also love it’s parent series The Section 31 Files. While I realize that Lost Frontier is it’s own show, it’s still good to see it return to it’s roots with the re-appearance of S31 characters Emperor Korg, Bishop, and…the Judah hologram, hereafter referred to as Judahgram. Part 1 starts out with the Enterprise recieving a message from Emperor Korg, asking for their help and requesting to meet with Captain Trask and Mak as soon as possible. When the ship arrives at the Klingon homeworld, Trask has to give Korg the bad news that not only is Mak dead for good, murdered by another Novachron, but also that he got body-snatched by Equity Corps. It’s not all bad news, though: Korg reveals that the reason he needs the help of the Enterprise and her crew is that he thinks he’s found his long-lost adopted daughter Dalonna after picking up a faint, outdated signal coming from a backwater planet. When they arrive at the signal’s planet of origin, they find an abandoned camp, a crashed shuttle, and a holo-projector containing the Judahgram. Judah’s memory is outdated, however, and his batteries are running low. He doesn’t remember what happened to Dalonna, but he does know that she’s no longer on the planet. All in all, two of my favorite episodes. Not just because Bishop and Judah(gram) are re-introduced, but because these two episodes just seem bigger and more epic than the rest, which are wonderful and epic enough in their own rights. I’m not entirely sure where this show went (I’m not one to talk, though, and this is infinitesimal compared to the amount of work that goes into a single episode of well-done audio drama) but I hope it comes back soon to make my ears happy and get my conspiracy motor running… I needs me more trekkie goodness, and this is one of my favorite Star Trek fan works evar. I loathe Valentines Day. I really do. Everything is pink and fluffy and covered in glitter, and there’s a distinctly nauseating sense of mushiness everywhere. No, I’m not disgruntled over the fact that I’ll be spending Valentines Day with just a bag of Reese’s chocolate and Gaia Episode 7 for company. Don’t look at me like that. Gaia’s Voyages Episode 6 deals with something infinitely more badass than pink paper hearts, though: Valentine’s Day…in Space. I’d take that over Reese’ s any day. So much greatness happened in this episode, I don’t even know where to begin…Duels and dances, serenades and soon-to-be sword fights… oh, and Valentine’s cards. Speaking of which, my absolute favorite moment of pretty much the entire episode was the bit where Natty is handing out Valentines, including a sparkly one for Armarok, whom she promptly glomps and dubs her adopted brother, saying that maybe if he got more hugs he wouldn’t be so grumpy. Gratz to writer/creator/ Elaine Barrett for giving us something to giggle about, ’cause as mental images go, that one’s pretty great. So is the one of Andre, musketeer wannabe, challenging Zeet and then, somehow, Mycroft to a duel in the name of love. This whole episode was straight-up fun, and Episode 7 looks like it’ll be just as good if not better. Can’t wait for St. V’s Day, and the hour long episode (!!!) that awaits! And now, for the stunning conclusion to the DP-Who three-parter “Dreamers”! I love DP-Who, even the older episodes, but in comparison to the rest I’ve got to say that the ‘Dreamers’ story is a thing of beauty. I mean, come on: Doctor Who + Celtic mythology = pure concentrated win in a jar. Also, there’s the freak-out factor: I’m rarely seriously disturbed by anything that doesn’t involve fish, and yet this tale of shiny evil horse-creatures, ghostly trains and hijacked minds never failed to give me the shivers. In the finale episode, the Doctor Time-Lord mindlocks the Taibhsi’s minions. They start claiming they’re gods, the Doctor loses patience, and takes a look through their memories to find out the truth. They’d been seduced by the Taibhsi, who are using the power of Ley lines to come back into the human realm. The London Underground follows the path of these mystical lines, and the Taibhsi are exploiting it. The Doctor gets annoyed with people selling out their own kind for their own benefit, and they show him how to open the doorway. Jason Tate’s personality is still vying for dominance. Emma “wakes up” back in her apartment in present-day London with Jason Tate, and seems to be having a pretty good time until the Doctor shows up and tells her that it’s all in her head. The Oneirosphere is nearly ready with the addition of so many new minds, but something is impeding the link — they need the Doctor’s mind, and just in time, the Doctor shows up makes them regret it by proceeding to frak up the Taibhsi’s plans AND Emma’s dream before sending the dreamers back to the waking world. The Taibhsi (that’s just a fun word to type) try to take over the Doctor’s mind, and get a nasty little shock when they find out that he’s got an extremely powerful one, far too powerful for them to begin to comprehend let alone dominate. The Doctor skips over all the ‘angst’ right to the actiony bit, banishes the Taibhsi to wherever it was they were before, frees the dreaming minds, and restores London. Looks like it really is “New Doctor, new rules” — except for one rule, at least: No second chances. Upon re-listening to this episode, I noticed something that I missed the first time: the minions tell the Doctor that Gallifrey is coming back, and that they saw it in his mind. Now, that is something I’m really looking forward too, even more so after coming away from the TV version of that same event feeling a little disappointed. Gallifrey rises? Again? Hopefully. The conclusion of the Dreamers storyline definitely didn’t disappoint in any aspect from the writing (crazygood) to the mixing (gorgeous) to the acting (great work by David Ault and M Sieiro Garcia, and the entirety of the ensemble cast). I’m definitely liking the direction Season 3 is going, and as always, I’m drooling onto the keyboard in anticipation of more. … no, really, there’s actual drool. 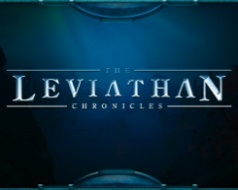 Today, and of course by ‘today’ I mean yesterday, a new episode of Leviathan was released, and I wrote a review for it. This is not that review. No, this is the review for the chapter before that chapter. The other review comes later. After finally seeing the city of Leviathan in the last few chapters, I’d sadly almost forgotten that there were actually other characters, and that they were important too. Eep. Chapter 23 solves this problem, however, by rejoining Mai Lee and Oberlin on the Tangula railway, which I seriously wish I could use to commute to and from college. (A guy comes to your door and offers you ice cream from a little cart! How cool is that?!) Unfortunately, they are unable to fully enjoy the ice cream and the open bar, because Whitt Roberts has sneaked his way onto the train, and is busy looking for his two quarries. He’s more than a little pissed off; this is understandable, since because Oberlin left him with just the one ear, Whitt has lost his ability to blend in and disguise himself easily. Since he’s an assassin, this is not the best thing ever. (Note: The ‘Leviathan Line of the Month Award’ is given to Whitt Roberts for “I need equiptment for my equiptment!”) Apart from wreaking horribly painful vengeance and finishing the job he’d started, he’s mostly trying to get his extremely important briefcase back so that Blackdoor can complete their ultra-secret extraction mission. Words and sharp, pointy things fly back and forth, but after quite a few death threats and accusations, Whitt, Mai Lee, and Oberlin reach an uneasy temporary truce. Oberlin did something technical and brilliant to the briefcase, and now it’s locked and he’s the only one who knows how to open it. This renders it more or less useless to Whitt and Blackdoor, and gives Oberlin and Mai Lee a valuable bargaining chip: Oberlin won’t open the briefcase until Mai Lee is reunited with her father… and this means that Whitt Roberts is going to have two companions on his trip up Mt. Chenglung. None of them are very happy about this. Meanwhile, also in Tibet, Sienshun and Nathaniel have landed and are trying to find Macallan. They obviously don’t know that she’s already in Leviathan, or that Blackdoor is on their way. The countdown has started leading up to the Season 1 finale, and while Chapter 23 is wonderful and amazing, the long-standing tradition of each episode of the Leviathan Chronicles being better than the last still stands. It’s a brilliant lead-in to the season finale, and has some great moments and wonderful dialogue, especially between Oberlin and Roberts. I still can’t get over the ice-cream cart, though, or the fact that Leviathan is and always will be one of my favorite things on the internet. Now, excuse me… my brain is still recovering from Episode 24. I have to go lie back down and twitch. This entry was posted on February 13, 2010 at 1:58 am and is filed under BrokenSea, Darker Projects, The Leviathan Chronicles with tags Doctor Who, Episode Review, Gaia's Voyages, Leviathan Chronicles, Lost Frontier, Meta Review, Special. You can follow any responses to this entry through the RSS 2.0 feed. You can leave a response, or trackback from your own site. Thanks! =D It’s good to know I was missed, and that people are glad I’m back. Thanks for the compliments, and for reading!